In a recent post on their facebook page the RSA Franklin commented on the Empty Chair ceremony held by the Franklin Lodge No. 58. RSA Franklin President, Shelly Boyes, was invited to participate in the remembrance ceremony known as 'The Vacant Chair', which symbolises a fallen serviceman or woman. The ceremony was an interesting blend of military remembrance tradition with masonic custom, to commemorate not only those who served but also the 37 fallen Franklin masonic brethren. Shelly also laid a wreath on the part of RSA Franklin together with wreathes laid by masonic representatives, The Worshipful Master of the Franklin Lodge, Stuart Harrison, and the District Grand Master, John Lukaszewicz. Presenting 10 year Bar to RW Bro Ross Agnew’s 50 year Badge at Lodge Manurewa No.222. The “Ceremony of the Vacant Chair” held by The Franklin Lodge No.58 in memory of the fallen, set the scene for the forthcoming ANZAC Day Parades. VW Bro Mark Hall G Lec for the Division, has made himself available for your Lecture evenings. Please consider Mark as an option. If you have a job at an Installation please attend rehearsal, your attendance is necessary and you will be missed by your absence. 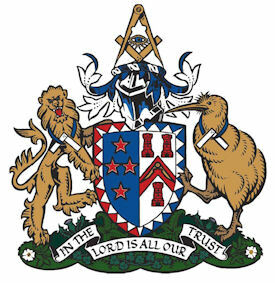 Counties Hauraki District has surpassed our expectations at Installations, GL Visits and special events by the Organisation, Quality and sheer numbers in attendance – Thank you for making those occasions special for all concerned from Myself, Geoff, John & Alan. To read the latest Counties-Hauraki Monthly Newsletter click here.